Captain America first appeared in Captain America Comics #1 (March 1941), from Marvel Comics’ 1940s predecessor, Timely Comics, and was created by Joe Simon and Jack Kirby. 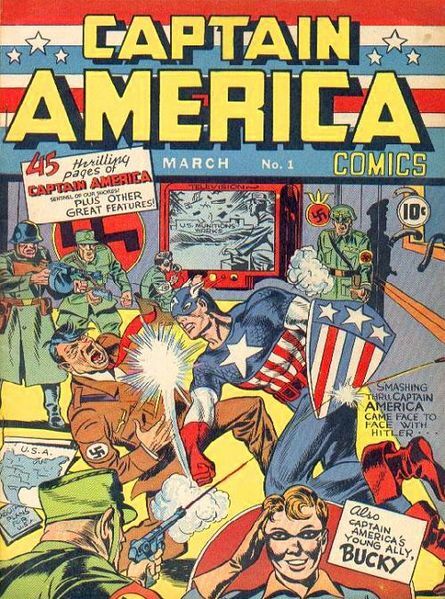 Captain America was Timely Comics’ most popular character during the wartime period. After the war ended, the character’s popularity waned and he disappeared by the 1950s aside from an ill-fated revival in 1953. Captain America was reintroduced during the Silver Age of comics when he was revived from suspended animation by the superhero team the Avengers in The Avengers #4 (March 1964). In the 2006-2007 “Civil War” crossover, Captain America opposes mandatory federal registration of all super-powered beings, which he sees as an erosion of civil liberties for the superhero community, and leads the Anti-Registration faction and resistance movement. He becomes a fugitive and opposes the heroes of the Pro-Registration group, including his former friend Iron Man. He adopts the alias “Brett Hendrick”, a mall security guard, to avoid government detection. Captain America battles Iron Man during the climactic battle and has victory within his grasp when a group of civilians attempts to restrain him. Rogers realizes that he is endangering the very people he has sworn to protect. He then surrenders to the authorities and orders the anti-Registration forces to stand down. Following his surrender, Steve Rogers is indicted on multiple criminal charges. As he is brought to a federal courthouse, a sniper shoots him in the back. In the chaos that ensues, he is wounded three more times in the stomach and chest by Sharon Carter. Rogers is taken to a hospital, where he dies. The assassination, orchestrated by the Red Skull, involves Crossbones as the sniper and Dr. Faustus posing as a S.H.I.E.L.D. psychiatrist, who gives Carter a hypnotic suggestion to shoot Rogers at a crucial moment. Captain America #25 is a particularly powerful story. Brubaker plots and paces it masterfully, never lapsing into sentimentality or abandoning the dark and mature feel he’s brought to the book since its re-launch. 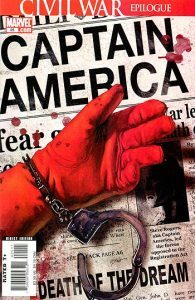 Ed Brubaker’s themes and dialogue, Steve Epting’s realistic artwork, and Frank D’Armata’s coloring, with its dark tones, splattered blood, have given Cap a harder edge than he’s ever had over the last 25 issues. A suitably grim conclusion to a gloomy, hard-nosed series, this issue may not be the final end of Captain America, but even as a break in his endless story, it’s got a lot of passion something that the character’s been lacking for some time. Brubaker understands the Captain America mystic and treats the character with the proper respect he deserves as one of our oldest comic symbols of justice and the American way of freedom. 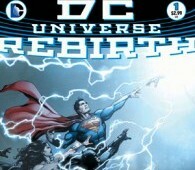 “The Confession” is a One-Shot summation of the reason for the “Civil War”. It concludes why freedom is important and why the erosion of civil liberties for any group of people is wrong. Did we not learn our lesson in the Japanese camps for American born Japanese during WWII. If you don’t learn from history you are bound to repeat it. Steve Rogers was born on July 4, 1917 in the Lower East Side of Manhattan, New York City, to Irish immigrants Sarah and Joseph Rogers. Joseph Rogers died when Steve was only a child and his mother, Sarah, died of pneumonia while Steve was a teen. By early 1940, before America’s entry into World War II, Rogers is a tall but scrawny fine arts student specializing in illustration. Disturbed by the rise of the Third Reich, Rogers attempts to enlist, only to be rejected due to his poor constitution. U.S. Army General Chester Phillips, looking for test subjects, offers Rogers the chance to serve his country by taking part in a top-secret defense project — Operation: Rebirth, which seeks to develop a means of creating physically superior soldiers. Rogers volunteers for the research and, after a rigorous selection process, is chosen as the first human test subject for the Super-Soldier serum developed by the scientist “Dr. Josef Reinstein,” later retroactively changed to a code name for the scientist Abraham Erskine. That night Operation: Rebirth is implemented, Rogers receives injections and oral doses of the Super-Soldier Serum. He is then exposed to a controlled burst of “Vita-Rays” that activate and stabilize the chemicals in his system. Although the process is arduous physically, it successfully alters his physiology almost instantly from its relatively frail form to the maximum of human efficiency, greatly enhancing his musculature and reflexes. Erskine declares Rogers to be the first of a new breed of man, a “nearly perfect human being.” After the physical transformation, a Nazi spy reveals himself and shoots Dr. Erskine. Because the scientist had committed the crucial portions of the Super-Soldier formula to memory, it cannot be duplicated. Writer Joe Simon conceived the idea for Captain America, which was refined by his partner, artist Jack Kirby, in 1941. Captain America was a consciously political creation. Simon and Kirby were morally repulsed by the actions of Nazi Germany in the years leading up to the United States’ involvement in World War II and felt war was inevitable. Simon later said, “The opponents to the war were all quite well organized. We wanted to have our say too. 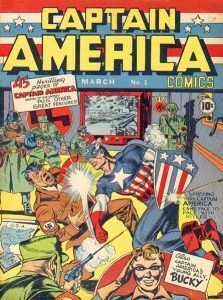 Captain America Comics #1 (March 1941) — on sale in December 1940, a year before the bombing of Pearl Harbor but a full year into World War II, showed the protagonist punching Nazi leader Adolf Hitler in the jaw — sold nearly one million copies. Captain America immediately became the most prominent and enduring of that wave of superheroes introduced in American comic books prior to and during World War II.